This entry was posted on Saturday, October 29th, 2011 by Frances Ryan. We’ve heard it a million times before: “One man’s junk is another man’s treasure.” Well, let me just say that I’ve found a treasure in amidst the junk—The Junk Rooms, that is. And now, it’s become a Cocktail Mecca for me and my friend, Rebecca, who introduced me to the place. The Junk Rooms is filled with, well, junk. It’s a mismatch of jumbled tables and chairs with trinkets, nick-knacks, and pictures all over the place (most of which are available for sale). Once you ascend the stairs to the main dining area, you feel as if you’ve entered your grandmother’s attic (in a good, nostalgic way; not in a bad smelly old person way). Anyhow, last night was Cocktail Night and I really had a fantastic time. I don’t know if it was the martinis, the company, or the fact that the owner had just gotten several boxes of old books from an estate sale and we found ourselves sorting through the paper treasures most of the evening. Actually, it was probably a combination of all three. Funnily enough I didn’t get a photo of my cocktails either! 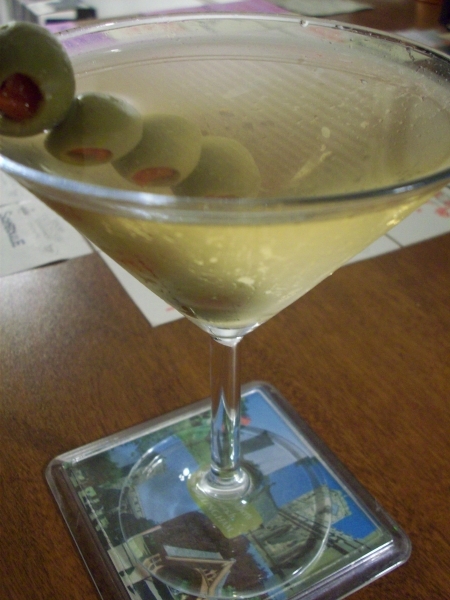 Hmm… 4 olives in the martini? SOLD!